Less than one week after he appealed to Igbo industrialists and investors in Lagos to come home to Igboland and invest for the economic development of the South-East Region, the Abia State governor, Dr. Okezie Ikpeazu has reiterated his appeal, asking Igbo and indeed people of old Eastern Region of Nigeria to see the need of investing in the region and creating jobs as the only solution to crimes and criminality and other forms of insecurity challenge facing the region. in the fight against insecurity. He made the appeal at a one-day South-East/Delta states’ security conference organized by the Governor of Anambra State, Chief Willie Obiano, in Oka, the Anambra State capital. Speaking at the conference which has the burden of finding a lasting solution to the security challenge facing the South-East and Delta, Ikpeazu said; “I am convinced that crime and criminality is the great threat to our prosperity and progress as a people. “Crime has really touched and affected our values. We are a hardworking people, but crimes have been imported into our lexicon, lifestyles that have derailed us and it is fast destroying our values. Not until we come together to fight crime, our hopes and aspirations as the people of old eastern region will remain a mirage. “We must rise up to protect the value which we are known for, which is hard-work. We must do everything we can to hold down crime and criminals in our areas. “I want to conclude by saying that I want to call on Ndigbo, like I did in Lagos during the week, to look back home and join in our current fight gazing crimes and criminality in our region. We expect our people join in this fight by investing in the region, and help in finding solution to the problem of unemployment that has created rooms for all kinds of crimes and criminality in our region.”nikpeazu said. 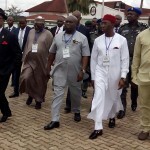 The conference which has; Security, Bedrock of Governance, as it’s theme, was organized by Governor Willie Obiano,0 of Anambra State, with the Governors of Abia State, Dr. Okezie Ikpeazu, Delta State and Enugu State Senator Ifeanyi Okowa and Hon. Ifeanyi Ugwuanyi in attendance, while the Ebonyi State governor was represented by the State’s Secretary to the State Government. The Inspector General of Police, Mr. Solomon Arese and the Director General of Department of State Security (DSS) Lawal Musa Daura, delivered papers on security.